Flying above the altitude of 2860M, the most popular trek begins from the Lukla. Everest Base Camp itself sounds so magnificent that from every people around the globe loves to visit once in a lifetime. From the Lukla airport, the trail advances through the Sherpa villages, forests of fir and rhododendron and across high suspension bridge along the way. Namche Bazaar is a vibrant, market with a trader from around the villages and as far as Tibet. Views of Island peak, Lhotse, Ama Dablam are the major part which encloses the panoramic view. The magnificent view of Mt. Everest from the Kala Patthar is the major trekking zone. Incredible mountain flights in and out of Lukla by doing breakfast in Everest can be breath-taking. Staying in a mountain tea houses will help to relax our mind and soul, and continuation of inner peace with the passing cool breezes will take us to the heavenly world. Into the mountain village of Khumjung the school which has been established by Sir Edmund Hillary is also the major source of education to the recent point. Visit Everest Base Camp (5364M) from where all the major expedition starts. Views of Island peak, Lhotse, Ama Dablam are the major part which encloses the panoramic view. Full Day Sightseeing In Kathmandu. Today after the breakfast we’ll be touring around the Kathmandu valley. The Durbar Squares, Pashupatinath temple, Swoyambhunath temple and Boudhanath temple are the major sight-seeing areas around the Kathmandu valley. These all are listed in a world heritage sites. The Durbar square shows us the regal life of ancient periods. Pashupatinath temple is one of the most sacred Hindu pilgrimages. Swoyambhunath temple and Boudhanath Stupa is the Buddhist temple which is very popular around the globe. Swoyambhunath is also known as money temple stands on the hilltop west of the Kathmandu valley. It can also be known as the viewpoint of Kathmandu valley. Boudhanath temple is the biggest Chhorten ever made around the world. The first flight to Lukla takes place very early in the morning. Depending on the time, you will have your breakfast either in the hotel or upon arrival in Lukla. You will be transferred to the domestic terminal of Kathmandu Airport from where you take your flight to Lukla which is about 40 minutes landing on the narrow, sleeping runway high above the Dudh Koshi River. Your porters and support staff will be waiting at the airport to help you with your luggage to start your trek to Phakding. The trek to Phakding is an easy walk for the first day with a mostly downhill leg. The trek will take you through pastoral lands through several small villages and farms. Approximately after 3 hours, we reach Phakding where we spend our overnight in the tea houses that are probably run by Sherpas. After breakfast, your tour guide will brief you about the day. An easy walk today to Monjo will take you through the pine trees and glimpses of distant snow-capped peaks. You will encounter few impressive waterfalls and yaks along the way taking necessary foods and other essentials for the trekkers as well as the locals. You will pass through the checkpoint before reaching Monjo where the officials check your permits. All trekkers to this region require TIMS cards and National Park Entry Fee. Your guide will sort out the paper works while you can stroll around for a bit. After this you officially enter the Sagarmatha National Park and a little way up the trail, you arrive in Monjo where you will stop for lunch. After Lunch, you start your trek through the wooded valley on a good trail crossing the river through high suspension bridge. Right after the bridge is the upward climb towards Namche. An hour and a half long ascent to Namche is famous among the locals as “Namche Ko Ukalo” meaning the uphill of Namche. It is all uphill till you reach Namche, and about an hour before reaching Namche your hard work will be rewarded by your first view of Everest. Your guide will walk you to the lodge you will be staying overnight. Being situated at high altitude, Namche Bazaar serves as an acclimatization stop for climbers to avoid altitude sickness. Namche Bazaar is the main center of the Khumbu region and is facilitates with government offices, internet, ATM’s, restaurants and a colourful market. Our guides can take us to explore the real charm of Namche Bazaar. We can observe traditional Sherpa life and enjoy flora and fauna found at such altitude. Today we will ascend towards the biggest monastery of the Everest region located at Tengboche. It encloses within Sagarmatha National Park which is listed in a UNESCO world heritage site. The trek to Phunki will be easy, but afterward ascending will become relatively harder. The panoramic view of the Himalayas from the monastery shows us a divine universe built under the same range. We can observe a Buddhist religious ceremony. 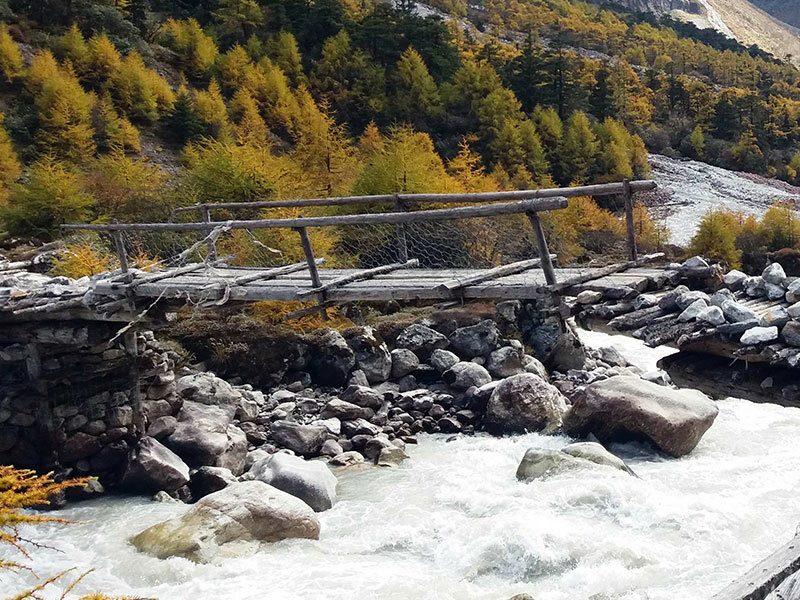 With a magnificent view of a rhododendron forest followed by a bridge over the raging Imja khola (River), we ascend towards Dingboche. We’ll pass the valley wall and then the plains to Pangboche village, the biggest settlement of the Sherpa in the region. It is a great opportunity to have a lunch with the Sherpa locals. Before advancing forward, today we’ll rest our legs and settle our body with the increasing altitude. Optional trek to the Valley will pay off with rewarding views, but taking it easy for today is the important thing. Although, we can climb a ridge located behind the village and see six of the world’s tallest peaks including Lhotse, Makalu and Cho Oyu. From here on forth, the trek will be gradually more challenging due to the high altitude. 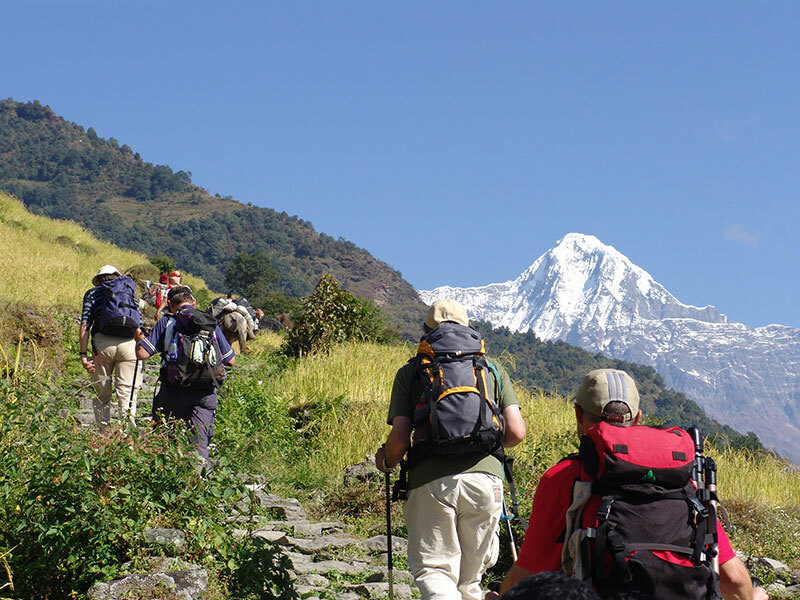 By trekking steep to the top of a high hill, we will be passing Dughla (Thukla). Before reaching Dughla, we trek across a wide pass which is much-wanted change from walking in a straight line. The company of Himalayas will be on all sides on our trek. After crossing Dughla, the trail passes through boulder-strewn slopes. As the trail drops to the Khumbu Glacier moraine, we find ourselves facing great peaks. For further advancement, we take the trail through the once vast Gorakshep Lake. We pass through rocky dunes, moraine, and streams. You head out on narrow tracks which are of few feet wide and few hundred meters above the ground. The distance between Lobuche and Gorakshep is of 4.5 km and will take approximately 2 hours to reach. From Gorakshep, It is approximately 3.4km to the Base Camp. As you walk across the rocks towards the many prayer flags that mark the spot, you will arrive at Everest Base Camp. During the expedition season, many of the groups are settled here in their respective camps awaiting their climb to the highest mountain in the world. You can even interact with some of them. 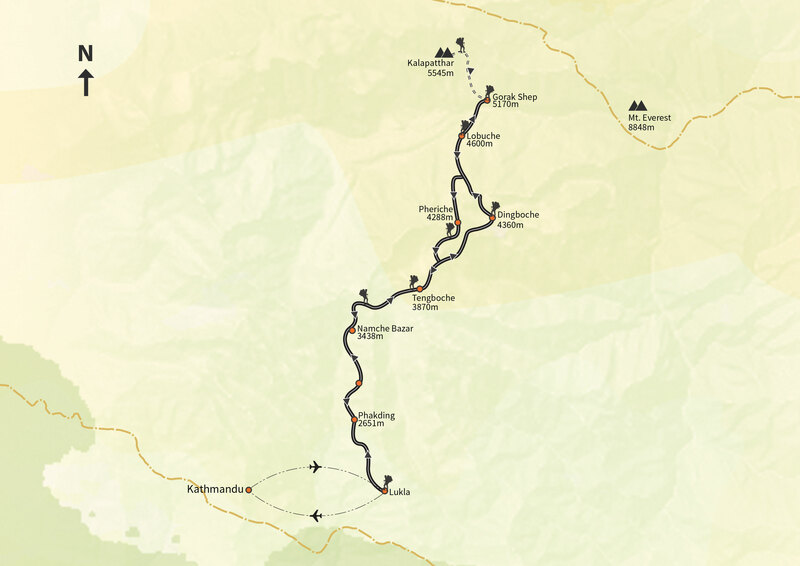 It will take approximately 2.5 hours to reach Everest Base Camp from Gorakshep. After taking photographs and enjoying the moment, we head back towards Gorakshep for the overnight. Kalapattar’s altitude is often given as 5550m but the hill, further along, is a little bit higher. One fact is that you do not see the top of Kalapattar from Gorakshepe, only a false summit which is much lower. It is a fairly tiring walk up there unless you are well acclimatized. The views from the summit are memorable. Everest views are the best you can get from this place. Descent from Kalapattar is easy, just a quick straight down walk to Gorakshep and we advance towards Pheriche. The route to Pheriche will be rapid as we descend and it will be easy as well. Back to Tengboche is mainly downhill from Pheriche, although, contrary it require an hour scaling a hill. We will be reaching Namche approximately in the late afternoon and off to bed. After Overnight at Namche, early morning we will descend back to Lukla. The trekking though the trail will be exciting as well as easier as it will go through the forest of rhododendron and pines. We will pass Monjo after a short walk and then to Phakding. We stay on the same trail and advance towards Nurning and approximately 8 hours of the trek we will finally be reaching Lukla. We will enjoy our last view of the high mountains while flying back to the Kathmandu from Lukla. The snow-capped mountains will be worth to watch. After 25 minutes of flight, our representative will be waiting for you at domestic airport to take you back to the hotel where you can enjoy your chilled beer and warm shower. Depending on your flight time you will be transferred to the airport. The airport check-in is 3 hours prior to the departure time and the hotel checkout time is 12 PM. In case your flight is late evening please let us know if you require half day use of the hotel. Day 2 : Full Day Sightseeing In Kathmandu.